Learning the truths of Scripture can be a lot of fun! Host a feast to help your children remember and understand the contrast between pursuing wisdom and pursuingfoolishness. Proverbs 9 paints a vivid picture of wisdom and folly, personified as two women. One woman, Wisdom, has prepared tasty meat and mixed wine. She sends out her young women to call out from the city’s high places, inviting the naïve and immature to come to her feast. Here they will gain insight and understanding. Another woman, Folly, has also prepared her feast and bids the simple join her. However, her feast does not lead to wisdom. 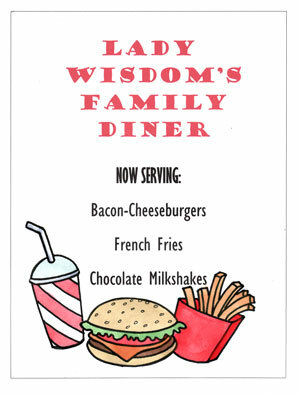 Host a “Lady Wisdom and Dame Folly” feast for your children. Celebrate this feast with another family, and leave all the children with the dads for the afternoon, while the moms prepare the house and food. Or arrange for your children to stay with a friend or grandparents for the afternoon while you prepare. It will be more fun if you can surprise your children. Prepare two “feasts” to be served in two different rooms. Study the descriptions of wisdom and folly in Chapters 1 through 9 of Proverbs, and design your feasts to picture the words of these Scripture passages. Prepare to serve Lady Wisdom’s feast in your dining room with candlelight, relaxing music, your best china, and rich, elegant foods. Make sure you serve a favorite dessert! OR, if your children will think a comfort-food meal of favorite dishes (hamburgers, pizza, tacos, etc.) is a more attractive treat, serve those kinds of foods. The idea is to have lots of goodfood that everyone will really enjoy, in an atmosphere that everyone will enjoy! 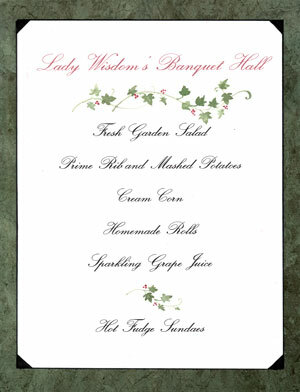 Plan to serve Dame Folly’s “feast” in a hidden place – a closet, attic room, or basement. Burn scented candles or spray air freshener to make the room smell good. Play noisy, dissonant selections for background music. Decorate the walls with pictures of skeletons, an ox, a man in stocks, a bird in a snare (look for pictures online). Serve very small servings of honey, oil, and bread, with strong-tasting greens such as kale or spinach for dessert (yum). If you want, write out menus for both meals. Use appropriate fonts and artwork to match the ambience of both rooms. When your children return home, invite them to the feasts. Meet them at the door with your invitations (and menus, if you choose to use them). One parent, nicely dressed, can cry out from the dining room door withWisdom’s invitation, as it is recorded in Proverbs 9:4-6 (or a paraphrase of her words). “Whoever is simple, let him turn in here! Come, eat of my breadand drink of the wine I have mixed. Leave your simple ways, and live, and walk in the way of insight.” Don’t be shy! Be dramatic, and ham this up good! Show the children your menu. Urge them to join you. The other parent, equally attractive and persuasive, can present Folly’s invitation from Proverbs 9:16-17. “Whoever is simple, let him turn in here! Stolen water is sweet, and bread eaten in secret is pleasant.” Don’t be too obviously evil. Folly is deceitful; it usually looks pretty appealing. Try to convince them to join you. The more dramatic you are, the better you will get your point across, and the more your children will remember the lessons of this event. Ask your children to choose which feast they will attend. Usher them into the room and eat your feast together. If some children choseFolly’s meal, eat that meal with them — it won’t take long. Those that chose Wisdom’s feast can stand at the door and observe. 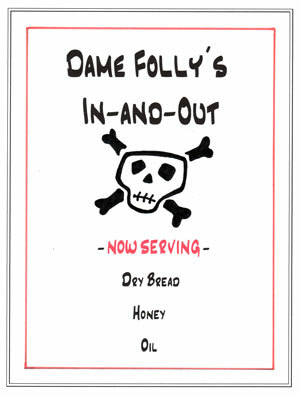 Discuss Dame Folly, and the deathly results of following her. Perhaps Dad can start acting like he’s choking or dying after eating his crust of bread. Tell these children that the next event is going to bed. Folly’s feast does not end well. No more partying. After they get the point, be sure to include them in the rest of the evening’s happenings. Move on to Wisdom’s feast. Invite those who may have chosen Folly’s feast to join you. They will soon see why Wisdom was the better choice. Linger long over Wisdom’s feast. Enjoy the time together. Have fun! Discuss with the children why they chose the meal they chose. Read passages from Proverbs 1-9 together and discuss the differences between wisdom and foolishness, and the blessing that accompanies wisdom contrasted to death that ultimately results from folly. Discuss which meal was best, and which choice in life is best, wisdom or foolishness. End the evening with some family games, a trip to the park, a treasure hunt for a special book (maybe Little Pilgrim’s Progress, a simpler version of John Bunyan’s classic, which vividly portrays to the contrast between following wisdom or folly, or Dangerous Journey, a picture book version of the same classic) followed by Daddy reading for the family, or a video that clearly demonstrates in its plot the contrast between foolishness and wisdom (again, a DVD of Pilgrim’s Progress, or this animated version, available on Netflix for those who have a subscription, would be a good option). NOTE: Another way to approach this event is to work with your children to prepare these feasts and then invite another family over to eat with you. Your children will learn a lot by working with you, studying the passages in Proverbs, and preparing the rooms, decorations, and food. And you will all get to share a fun evening with friends! After your feast day, use this meal as a launch for studying these chapters for the next several days in family worship or at the lunch table. When you have completed your study, take time to discuss what you have learned. How do wisdom and folly differ? How do the results of wisdom and folly differ? Pray for God’s wisdom, and for His strength to turn from folly. Ask each other, when decisions are made, if you are following after Wisdom or if you are being deceived by Folly.